Offered here is 000-12 Vintage number 2178 built by John Greven in 2012. It has a Lutz Spruce top and back and sides made of Brazilian Rosewood. John tells me that he has made only six 000-12 fret guitars over the years and of these, only three were made with Brazilian, so this is a special guitar. He gave this traditionally styled instrument a 25" string scale, a 1-13/16" bone nut and 2-9/32" string spacing. It has herringbone purfling and curly Koa binding and trim. It has a wood mosaic backstrip and a simple multi-ring wood fiber rosette. It has a mahogany neck with a comfortable soft V shape. The fretboard and the pyramid bridge are Black Ebony. 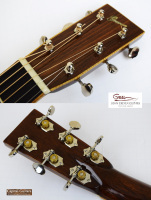 The headstock overlay is Brazilian Rosewood and the tuners are nickel Grover open backs with butterbean knobs. It was recently setup by a pro luthier and a K&K Pure Mini acoustic pickup was installed. This guitar has the look, feel and tone of a vintage piece, which is just what John intended. It is very lightly built and braced and it weighs just 3.8 pounds. It plays superbly and the tone is like that of a pre-war Martin and it's voice would make for a fabulous blues guitar. Check out the brief sound sample provided for a taste of the tone of this marvelous Greven guitar. It is currently setup with Elixir Phosphor Bronze light gauge strings with 12th fret string heights of 6/64" on the low E side and 4/64" on the high E side. As is so often the case with particularly special guitars, this instrument has seen it's share of play. It was owned by a pro and has been well cared for, but up close it shows it's share of shirt button scratches, tiny impressions and the like. Nothing serious mind you, but it shows lots of close-up evidence of play. It comes in a newer Guardian case which is in very good condition. 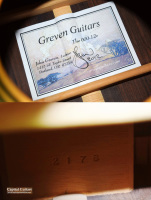 Greven guitars are highly sought after and with good reason. 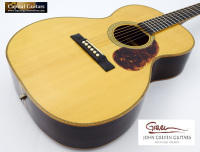 I've been told John isn't building any longer so there may not be any more new Greven guitars available, making it likely the value of existing Grevens will be on the rise. 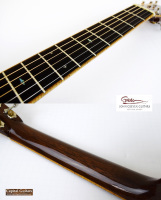 Here is an opportunity to get a high quality Greven guitar at a great price and a Brazilian Rosewood Greven at that! Make this beautiful Brazilian 000-12V yours today.